Recently on Friday 9th December I made my annual migration from Cambridge to Bangor in north-west Wales. For those of you who aren’t familiar with why I travel here each year – it’s Venom Day. 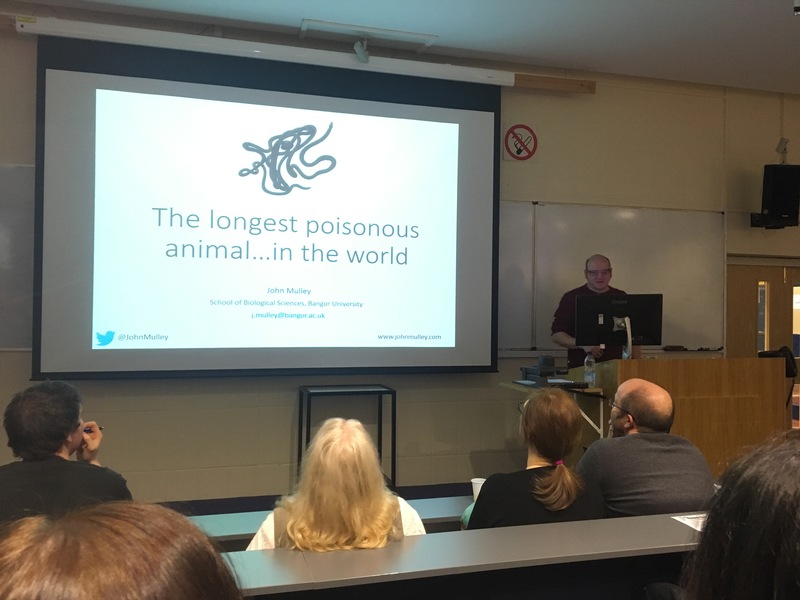 Venom Day is an annual one-day conference on all things venom held at Bangor University and organised by the Bangor University Herpetological Society. I made my way down on the Friday evening as the talks would be on the following day. I planned to arrive with time to spare, as well as to attend an Oxford-style debate which can be seen as a warm-up to Venom Day. I’m primarily an amphibian biologist so what was I doing at Venom Day? The answer is who isn’t fascinated by venomous reptiles (and other venomous animals)? It’s also a great way to network and speak to others about their research and discuss yours. The conference took place in November last year and because of my recent expedition to Malaysia I feared I’d missed it. Fortunately Venom Day was held a little later this year meaning I could still attend. One thing you learn quickly when you go to conferences is that beer is the universal currency for scientists and is a must when socialising. After sinking a few pints and enjoying the Oxford-style debate it was time to catch up with some friends I’d met at previous conferences. After we were sufficiently caught up it was time to head back to the hotel to get some sleep ready for the conference in the morning. In the morning it was an early start in order to get to the Brambell Building in time for registration. I always seems to overestimate how much time is needed and so when I arrived with my colleagues, we were the only ones there other than the event organisers. We found some seats in the middle of the lecture theatre and then secured some tea – lots of tea. Once sufficiently caffeinated it was time for the talks to begin. 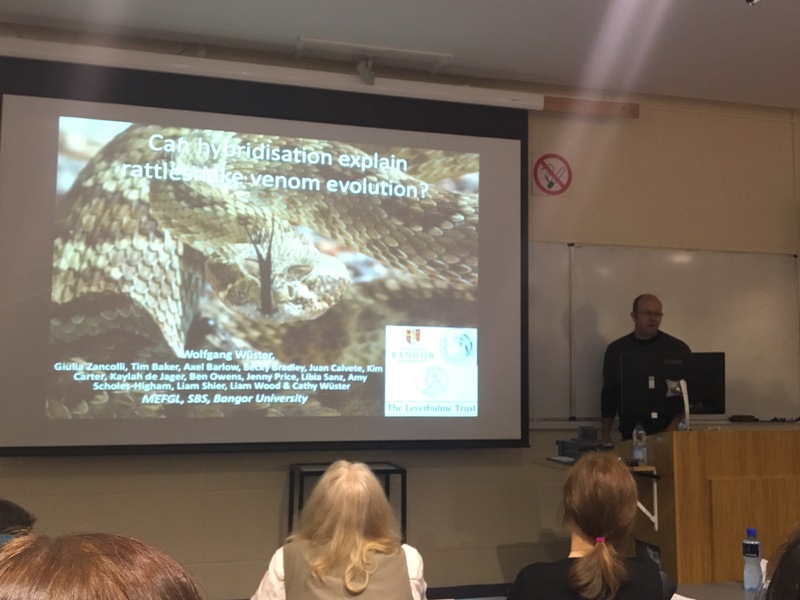 The talks ranged from how to tackle snakebites in Kenya to the venomous properties of slow lorises and how their populations are affected by conflict. All of the talks were truly informative and well delivered although I am happy to admit that a couple of aspects in some of them went over my head a little. Venom Day 2016 was comprised of 10 talks, ranging in length from 20 minutes to 50 minutes, last year there were 17 talks. Everyone remain engaged and interested up until the end of the day and unlike last year we managed to get a delegate photo. Venom Day is different to most other scientific conferences I have attended over the course of my scientific career in that it doesn’t have a poster session. I feel that it may have worked this year as there was plenty of spare time, things were more rushed in 2015 due to the shear number of presentations that had to be squeezed in. After the last speakers finished their talk, we had a quick drinks reception before attending a local restaurant where we all tucked into some delicious curry (vegetarian in my case). This was followed later by a drinking social, which is the only way to wrap up any scientific conference (as I’m sure most of you will agree). The following morning I packed my things ready for the long train journey home reflecting on the knowledge I’d gained the day before. I’d like to thank everyone that was involved in organising the day, Bangor is a long way to travel for me and as in previous years Venom Day rocked! 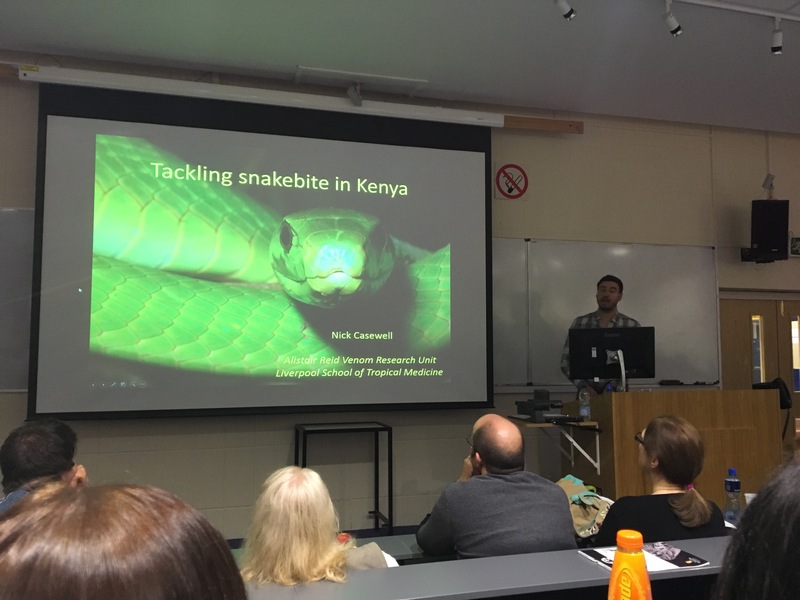 I would also like to thank all of the speakers for delivering some truly inspirational talks, Nick Casewell’s on the issues facing snakebite victims in Kenya was particularly eye-opening and thought provoking. Finally thanks to everyone who like me travelled to Bangor for the day, you helped to make it a great experience and because of everyone involved I can’t wait for Venom Day to come around next year!